5.) Getting my nails painted at Valley Nails in SoHo. Obsessed with these little kitties! 7.) Drinking coffee like it's my job. Hope you all are are having a lovely weekend! your pictures always look so dreamy! love your sweaters! Oh my... Just felt in love with your nails, the cat is so cute! That last picture of you is so good. You look so cozy! I just love your sweater! Where is it from? oh you look so cute!!! amazing pics! Nanette Lepore's perfume is my favorite! I wear it just about everyday, either that or Viktor and Rolf! I love the sweater! So cute!!!! Love your pics!! so sweet!! I'm dying to do kitties on my nails! So cute! I also love those socks! The first photo is beautiful as is the last. Love your sweater in the first picture! Nice post. Nice pictures and everything is just REALLY NICE! Your nails are the cutest! These photos are amazing! Are any of these taken with an iPhone? I'm still astounded by the quality of those cameras; it's kind of hard for me to tell the difference anymore! it is that time of year to be cozying up! Bonnie, I really really love your 'lately' posts! They make me know you more in your personal life and that just makes me love you more and more! You're such a sweet girl :) And high 5 to the phrase - drinking coffee like it's my job! Oh goodness. How cute are those kitty nails! i would be in that sweater every day too! It honestly looks like a dream come true to be living in New York. And wearing knits must just be divine there. Love this post, those nails are so cute! Que fotos tan bonitas! Creo qu tienes un don con la fotografía! To tell the truth, I'm super jealous that New York is getting chilly. You get to wear all those lovely sweaters and knit layers! I definitely can't wait for sweater weather around here, especially if I can find some sweaters that are as cute as the one you have on in that first photo. While we're on the topic of cute, how sweet is the photo itself? You're just too much adorableness! Oh and speaking of lovely fluffy knits and layering and whatnot, there's nothing like thick, fluffy socks for keeping the toes warm in the freezing mornings. On those cold mornings that are sure to be present, there's nothing better sounding than some hot coffee and maybe some deliciously seasonal cupcakes. Mmmmm....need I say anything else?! 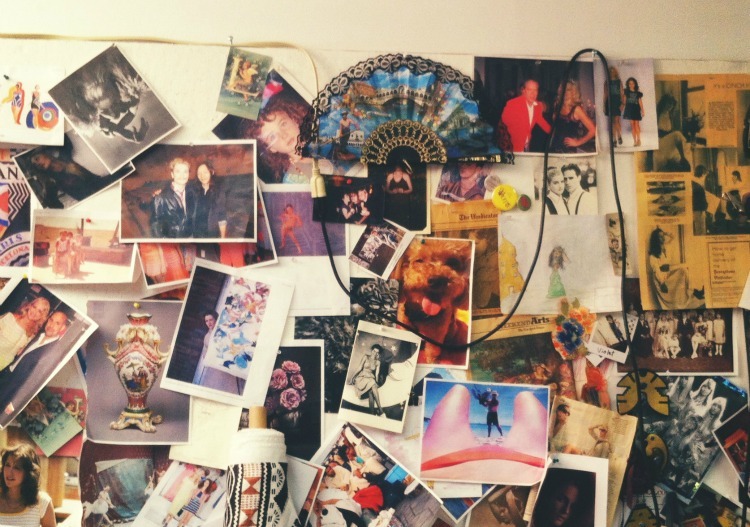 That inspiration board at Nanette Lepore's studio is all sorts of fabulous. I want my own now! Thanks for this little glimpse into your life!